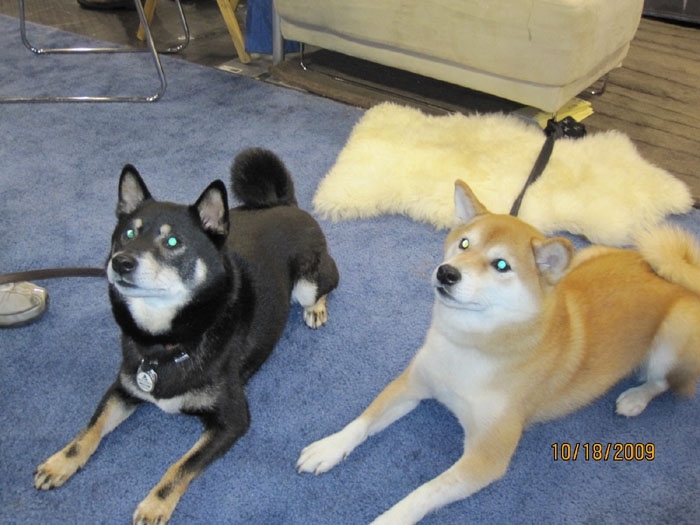 Multiple people, for various reasons, have asked for a post-event review of Meet the Breeds. I’m including some of the pre-planning information also, as I’ve been asked by a couple folks for advice on planning similar events. 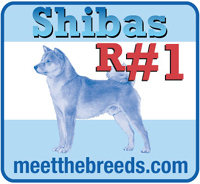 Meet the Breeds is an AKC event, with only the national breed club for each recognized breed being invited to participate. The purpose of the event is to help the public understand the differences between breeds directly from breed experts. 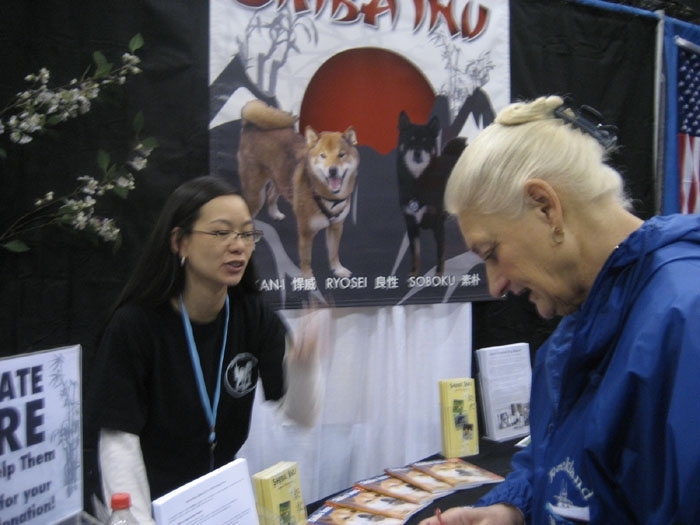 That meant I needed decor, materials and volunteers all up to the task of educating the public about our wonderful Shibas – their history, their characteristics, where to buy a puppy, how to adopt a rescue and more. Since all the events I’d planned and manned in the past were for NYCSR, I needed new booth decor and materials for this event. Luckily for me, I know a wonderful designer – my friend Scott Lauben – who also created the banners, brochures and other materials for NYCSR. I had photographs of banners used at events on the west coast and wanted to do something similar but unique. Scott did an amazing job creating the banners and signage you see in the photos below. I borrowed most of the booth supplies from NYCSR, only purchasing what was necessary to go with the new banners. The club also donated black club t-shirts for the volunteers so we all had matching tees to help set us apart. A list of recommended Shiba Inu breeders in the northeast (only given to people who specifically asked about breeders) including information on the national and regional Shiba clubs and Shiba rescue organizations. 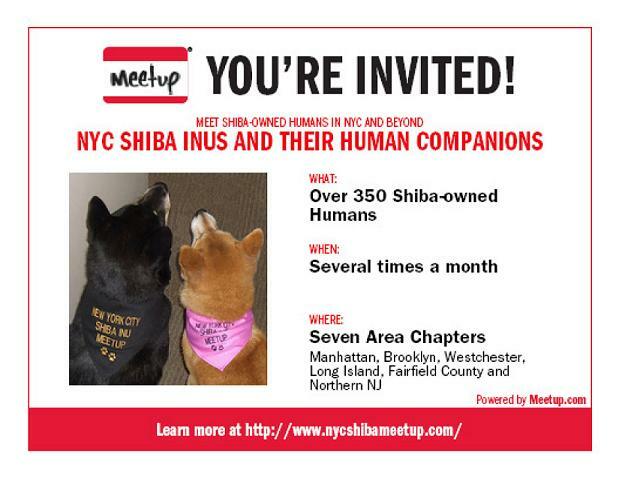 Postcard size info sheets about the meetup group for anyone who came by and said "I have a Shiba Inu," but didn’t know about the group already. 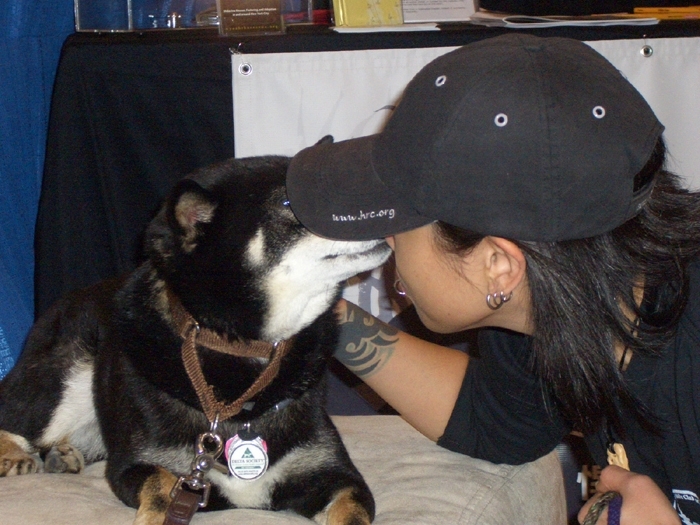 and, last but not least, for people who wanted more in depth breed information, we had copies of Laura Payton’s book, Shiba Inus (Complete Pet Owner’s Manual), available for an $8 donation to the rescue. Thank you Laura for your wonderful donation! None of the planning or materials would be worth anything without great volunteers to make it all happen during the event. 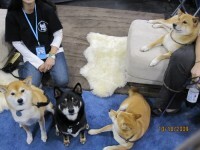 I was lucky enough to put together a great group of people from the Shiba Club of Greater NY, NYC Shiba Rescue, and the NYC Shiba Meetup. I want to say thank you to Kathy Mahoney, Barbara Leung, Molly Sumner, Antoinette Crudo, and Kathi Willi-Melton. I want to add a special thank you to Kathi’s husband, Matt Melton. We recruited Matt on Saturday morning to take a sick volunteer’s place. He was a huge help and ended up working all day Sunday too. So, Matt, you get the gold star for being so easy going about being recruited to work all weekend! Javits was open all day Friday for early set up, so my friend Kat Mahoney and I spent the afternoon and evening setting up the booth. We played around with several different layouts. Normally, for rescue events, I put the table along one side with the rugs and ottomans in the remaining area. This is partly because we’re selling items at rescue events and I want them easily accessible. For this event though, I wanted to be sure passersby could see the banner on the front of the table, so the table went along the back. We put it at an angle to cut down on the amount of space lost behind it (plus it looked cool that way). We put the ottomans up front, with the plan being to keep one or two dogs on each ottoman during the whole event. The actual event was amazing. The aisles were jam packed practically the entire time. 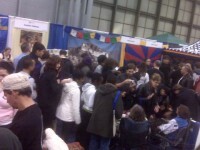 Our booth was mobbed. Several people mentioned that we had one of the busiest booths (more on that later). 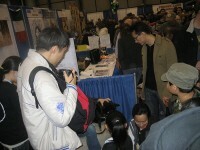 The crowd at this event was different from the crowd at a Pet Expo, pet fair, or even Responsible Dog Ownership Day. 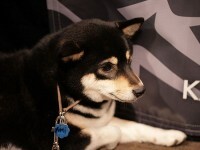 First, attendees couldn’t bring their own dogs, so they were more focused on the event itself. Secondly, it really felt like a large percentage of attendees were there to learn about the various breeds. 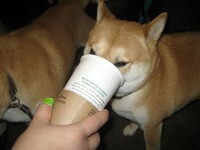 I’ve never been asked so many intelligent questions about Shibas in such a short period of time! I was really impressed and excited by some of the people I talked to. We had six dogs each day with three crates under the table for them to get breaks from the crowd, but they were still exhausted about two thirds of the way through the day each day. Events like this are hard – even for the most social dogs – and this one was noisier and busier than most. Snickers never wants to go in the crate during most events, but he actually asked for a couple breaks during this one. Breaking down and getting out of Javits on Sunday night was a nightmare, mostly because Javits only had one small elevator for most of us to use (only the folks with the big trucks were loading out through the freight exit), but also because no one but Kat stayed to help me break down and we were both ridiculously exhausted at that point. I’m hoping this will become an annual event, so I made mental notes all weekend regarding what went really well and what we could do better next time. In the interest of helping other people with similar events, here is what I learned. I had exactly the right number of people, but could have used more dogs. There were a lot of really fancy (and far out) booths there; we didn’t even compare. 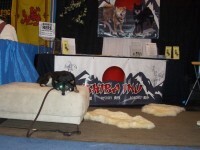 However, we had more dogs in our booth than most breeds and we had them up front and accessible most of the time. I think that was the reason our booth was so busy. I’d like to have more dogs next time so they get more breaks and stay fresh. 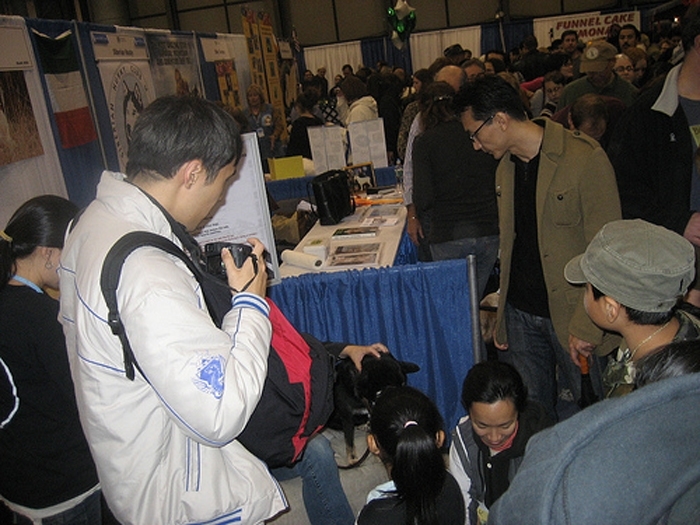 A 10×10 booth with a table and six+ dogs in it doesn’t have much room left for people though, so I have to figure out how to have more dogs without having more people! The layout of the booth needs to be tweaked. Having the ottomans up front was a great attraction, but it also caused a bottleneck where people couldn’t get out of the aisle and into the booth easily. Next time, I’m going to put together the handout materials and have them easily accessible to volunteers up front. We all had handfuls of brochures to hand out, but most of the flyers were on the table and we were scrambling to get specific flyers for people as needed. I’d rather give people too much information than too little, so next time everyone with their hand out gets one of everything (except the breeder list) all bundled together. Having identical t-shirts helped pull everything together and I’m going to look into somehow doing that for rescue events also. I had a GREAT mix of volunteers – rescue folks, breeders, owners. 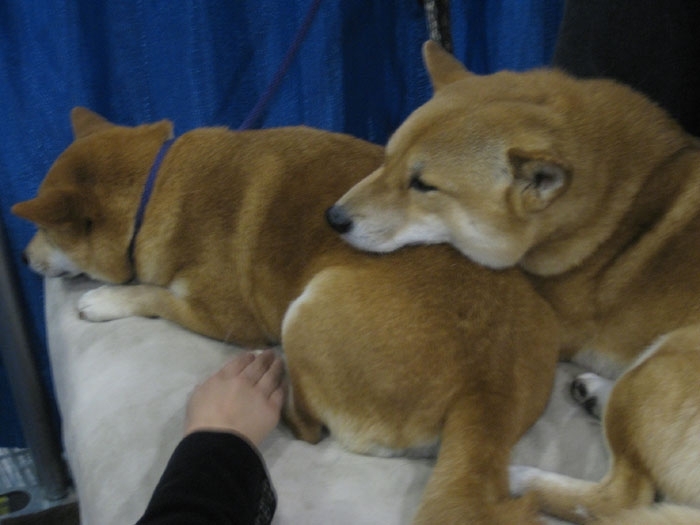 Between us we knew just about everything possible about Shibas. 🙂 I hope I can always have that sort of diverse and knowledgeable group! I think that’s everything. If I missed anything or you have any questions, please leave me a comment and I’ll do my best to answer! 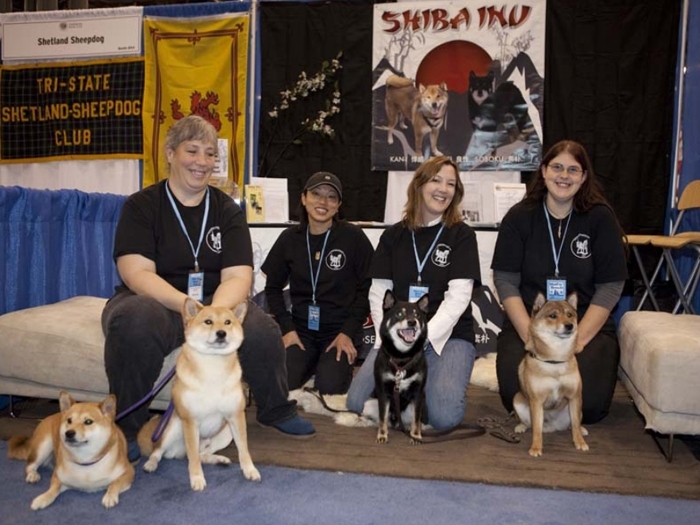 It might be interesting for you to get together with volunteers from other breed booths to see what their experiences were, and the things that they learned that might be useful next year. Perhaps (yet another!) a yahoogroups list? That is a good idea! I have to figure out a way to do that. This sounded awesome. I would have loved to go if we were closer, but I can only hope that Texas does something like this, too. I’d love to volunteer, or at least visit. 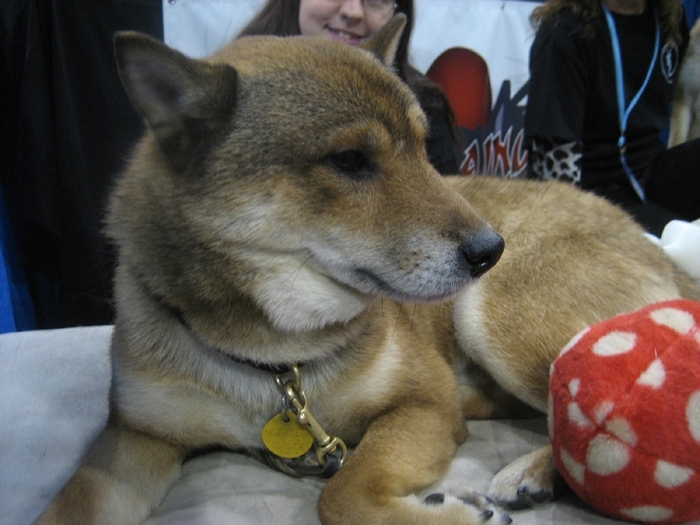 Though Koji loves meeting people, I’m not sure he would be up to the task of entertaining large crowds quite yet (he’s still a little excited at inside places not home, but getting better), but I’d love to go with or without him. My guess would be that only about 5 to 10% of dogs could handle this kind of event. It’s really tough on them. Not only is it tiring, but there are plenty of unpredictable people – little kids who jump on them and pull their ears, people in wheelchairs, etc. 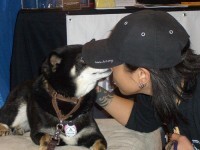 This was definitely the toughest event (for dogs) that Snick and I have ever attended. Thanks for a great write-up! I like your booth design. I had drafted up a “gameplan” for the event that showed who had which shifts and the dogs, who was bringing what material, who would help with set-up/breakdown, etc. We had an ex-pen in case the dogs needed space, but we didn’t use it. I didn’t bring my Shiba because one person needed to be available to do the table while others “talked Shiba” with their dogs and fair attendees. This was an outdoor event and the weather wasn’t great — strong winds most of the day — which made it interesting. The canopy for the booth occasionally threatened to lift off and all the handouts had to be weighted down. Snick and I have done a few of those fairs, both small and large, with NYCSR and it seems that the success of the event is dependent on the marketing of the overall event and, of course, the weather. I’m beginning to wonder if they’re really even worth the time and effort. When you think of everything that goes into it and the little bit you get out of it… I’m going to be a lot pickier about which ones we do going forward. The real win at fairs like that is the getting volunteer and foster applications. You’ll seldom make enough in donations to make it worth it. Your “gameplan” made me laugh… I usually do that too, even including lunch breaks in the schedule. Since this was a shorter event (10a-5p for 2 days) and I had so many people coming, I didn’t feel it was necessary. THAT is why I forgot to schedule set up and breakdown people – because I didn’t have a written schedule! I didn’t realize that was why until I read your comment. Thanks for the offer Rae. I had plenty of people during the event, almost too many really, in the booth. I could have used more dogs. And some help setting up and breaking down before and after the event would have been nice. I’ll let you know next time I’m planning one if I need more help! 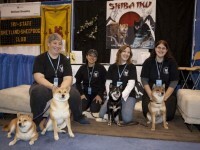 your site and the meet the breed event look great!! sorry i missed it! i was just working on my website and your name popped up…it’s been a while! i hope all is well for you and snickers! you both look wonderful! i have had my nose to the grindstone with soups and have had very little time to work on dog food yet i get at least two phone calls a week asking how someone can get it! LOL!! i need 24 more hours to a day to do it all! biz is tough these days! and i’m exhausted! would love to hear how you and snickers are doing and what you’re up to these days!